Started by MICA art students, Tinges Commons Garden had crops, flowers, changing art and often a message. 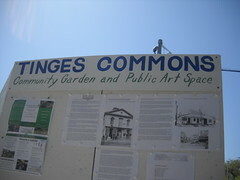 Most recently, July 2012, Tinges Commons hosted Text It!, a weekly display of community messages painted by artist Sarah McCann on the Tinges Commons Kiosk facing 33rd Street. This garden was organized with help from the Better Waverly Community Organization and the nearby Homestead Harvest Garden.